In this new biography of Billy McMahon's life, author Patrick Mullins recounts his inadequacies as well as his considerable impact on Australian politics. PATRICK MULLINS has apparently hit the jackpot: an important political figure – a former Prime Minister no less – who for some reason has been ignored by biographers. William – also known as Billy – McMahon’s reputation as the worst, or one of the worst, Prime Ministers of Australia must partly be the reason for the neglect of his story, together with his lack of statesmanship, gravitas and general appeal. Yet these character flaws are grist to the biographer’s mill as we learn how McMahon interacted with various heads of government departments, media barons, the Canberra press gallery and his cabinet colleagues. Most famously, McMahon was the Prime Minister who Labor’s Gough Whitlam toppled in 1972 after 23 years of Liberal-led government. But McMahon, a pygmy next to Whitlam in every way, is very important in Australia’s political history. He spent 33 years in the House of Representatives, with 21 of those years as a minister, including many years as Treasurer. His influence, from 1949 onwards, was immense, even though he was generally not liked or trusted by his fellow politicians. McMahon, as presented by Mullins, is certainly not likeable, even when we necessarily lower our standards, as we must, when assessing politicians. This is partly explained by McMahon’s unusual upbringing in Sydney, where a lack of parental love and affection was a defining feature. On the other hand, there was no want of opportunity, as his family didn’t lack the means of giving him a good education, leading to a legal career in Sydney in the 1940s. Possession of free will was the source of all good and evil. Gee, you may wonder, with those eternal verities, how could McMahon go wrong? Mmm. I'l give you the US President, but is Morrison really worse than Billy McMahon in his day. Can any really get lower than his level of stupidity, even if a muddled, religiously fanatical talker in tongues? MCM worst, ScoMo 2nd worst. Mullins paints a portrait of an archetypal politician: ambitious, selfish, vain, cunning, capricious, a habitual liar and dissembler, intent on milking all political perks, undermining his fellow Liberals if he saw an advantage to himself, leaking from cabinet at the drop of a hat and cultivating the media for favourable treatment. When things went wrong, as they often did, McMahon would never admit fault. Not surprisingly, McMahon was tolerated rather than admired by his Liberal contemporaries — Menzies, Holt, Gorton, Snedden, and Fraser. Although, to be fair, they all seemed to despise each other eventually. Even so, Mullins does not give a completely one-sided view of McMahon. While detailing the many failings of the man, there is a sense in which Mullins is alert to anything good that can be said, such as McMahon’s propensity for hard work and never-say-die attitude. There is also McMahon’s apparent devotion to his wife Sonia which is reciprocated. On the question of policy, McMahon was largely in step with the liberalism of the time, especially the hatred of trade unions and communism. He was also forever battling the Country Party (that he was in coalition with) on tariffs, trade and currency valuation. Yet there are some surprising policy stances, such as rejecting Gorton’s push for nuclear weapons and nuclear energy. On other policy matters, he tended to be constantly dithering, including on the Liberals’ commitment to the Vietnam War and our relations with China. This dithering is in contradistinction to Labor’s firm stance under Whitlam’s leadership to the same issues. Mullins shows that McMahon would be constantly on the telephone seeking opinions and on occasion he would simply be guided by the last opinion he happened to receive. McMahon’s telephone habit explains the title of Mullins’ book: Whitlam, who dominated Parliament as Opposition Leader when McMahon was Prime Minister from 1971-72, moved a censure motion against him in 1971 for his motives in sacking Ministers, including Gorton, and McMahon’s “subservience” to outside influences such as the media. Whitlam’s attack famously included the put-down “Tiberius with a telephone” that encapsulated McMahon’s weaknesses, small stature, high voice, lack of charisma, poor television performances, and penchant for telephoning all and sundry for advice. While McMahon was hopeless as a leader, his role in Australian political life was immensely important given his length of time in the Federal Parliament, especially as a Minister, during a period when Australia and the world were undergoing great change. This book documents his role in painful detail. The book also helpfully gives considerable insight into the workings of the public service and media in the latter half of the 20th Century. 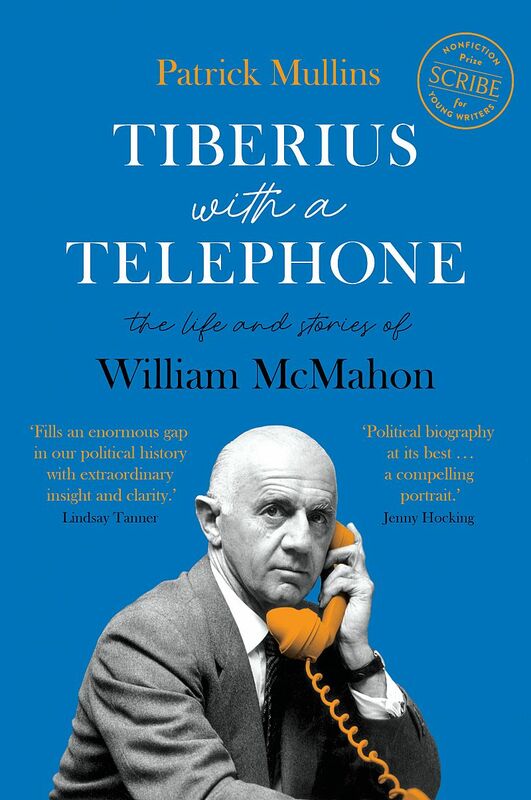 Patrick Mullins, Tiberius with a telephone: The life and stories of William McMahon, Scribe Publications, 2018.